St. Thomas has a Youth Orchestra for all children between the ages 9 – 16 who play an instrument and want to perform in a group with their friends from the Church. The Youth Orchestra was founded in 2012 by Diana Bourghol, who is also the conductor. She was inspired by the talented young musicians in the St. Thomas Armenian Church community. What initially started as a little quartet with her own children and godchildren has now grown to more than 15 young and talented performers. The orchestra performs Armenian and Classical music at various functions throughout the year, including the Armenian Christmas Luncheon, Palm Sunday Luncheon, and the Kirikian Armenian School Hantes. Members eagerly attend rehearsals and are excited to share their talents as well as their joy of music with others. Young musicians in the Armenian community are encouraged to join. All instruments are welcome, and there is no registration or sheet music fee. Students must be able to read music and have at least one year of study, either at school or with a private teacher. Practices are typically on Saturdays, varying between morning and afternoon times, and are arranged in coordination with the parents. For more information or to join, please contact Mrs. Diana Bourghol, Director, by mobile phone (201) 805-6721 or by email pdbourghol@yahoo.com. You may also contact the Church Office at (201) 567-5446. 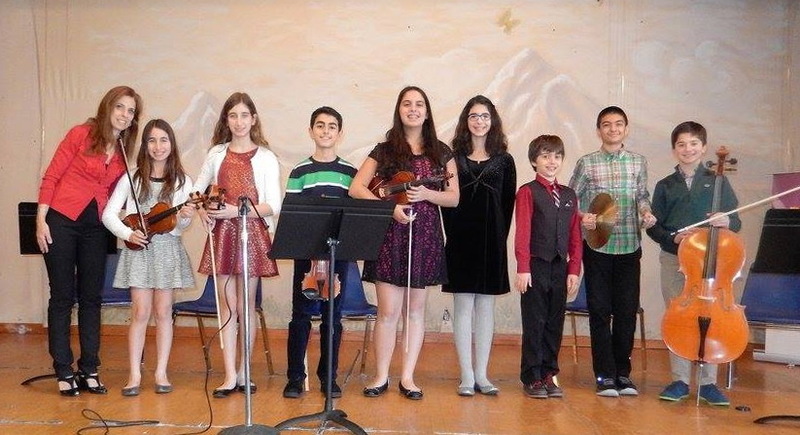 Director Diana Bourghol pictured with the Youth Orchestra after their 2016 Armenian Christmas Luncheon performance.